Ultra-luxury Silversea Cruises is offering four colourful South American voyages between the vibrant cities of Buenos Aires, Argentina and Santiago (Valparaíso), Chile in December 2009 and January 2010. With great airfares available and the Qantas direct service to Buenos Aires, as well as direct LAN services from Sydney via Auckland to Santiago, spectacular South America has never been more accessible for Australian travellers. Choose from a 16 day cruise departing Buenos Aires for Santiago on 4 December 2009, calling at the Uruguayan ports of Montevideo and Punta del Este; Puerto Madryn in Argentina, and Port Stanley in the Falkland Islands, then cruising the Magellan Strait. The all-suite Silver Cloud moves on to Punta Arenas, spending two days meandering through the magnificent Chilean Fjords and visiting the Chilean ports of Laguna San Rafael, Puerto Chacabuco and Puerto Montt. All-inclusive, cruise-only fares start from just US$7,197* per person, double occupancy. Silversea's generous fare includes luxury cruising to exciting ports; all-suite accommodation; gourmet meals; complimentary wines, Champagne and spirits, and all gratuities. Alternatively, start your journey in Santiago and spend Christmas and New Year at sea in luxurious Silversea style, with a 16 day departure on 20 December. 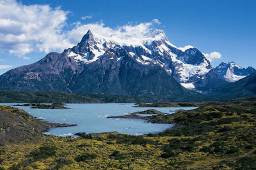 The festive voyage calls at Puerto Montt and Laguna San Rafael, cruising the Chilean Fjords and Magellan Strait to Punta Arenas and Ushuaia in Argentina, with its dramatic backdrop against the jagged Martial Range. After cruising Cape Horn and celebrating the New Year at sea, Silver Cloud visits Puerto Madryn, Montevideo and finishes in Buenos Aires on 5 January. Guests aboard this voyage will be entertained by fascinating guest lecturer Michael Buerk, one of Britain's leading broadcast journalists who has reported for the BBC on subjects ranging from royal weddings to the Ethiopian famine in 1984. All-inclusive, cruise-only fares start from just US$7,547* per person, double occupancy. Slightly shorter 15 day options depart Buenos Aires on 5 January 2010 and Santiago on 20 January 2010, with fares starting from US$7,113* per person, double occupancy.